Note: Some operations, such as wiping a file , wiping and deleting the contents of the Recycle Bin , or wiping free space on a single disk, can be performed directly from the shortcut menu without starting R-Wipe & Clean . 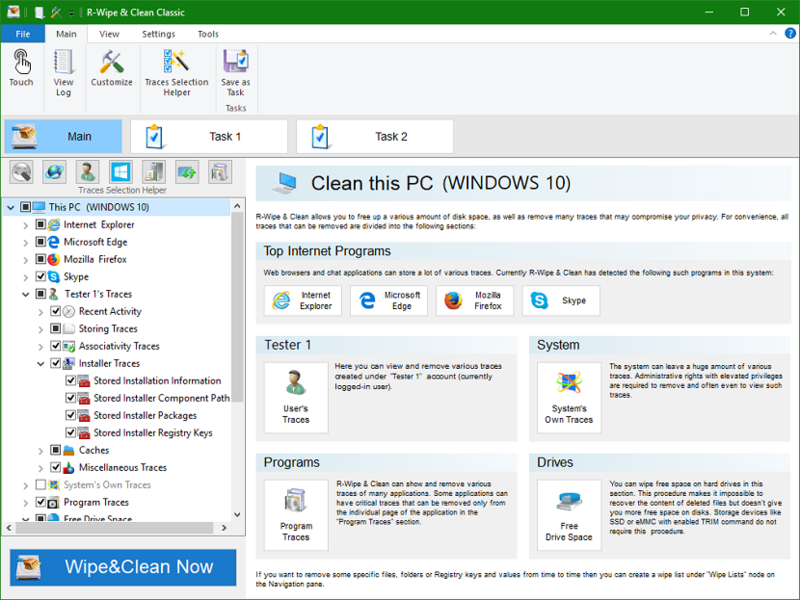 When R-Wipe & Clean starts, its main panel appears. You may customize R-Wipe & Clean to view only necessary items. Click the controls on the main panel to learn their functions. Boss Key: Sets the Boss Key for various Internet applications. Task Transfer: Starts task exchange from one computer to another. You may turn on and off the toolbar. Select/deselect Minimized Ribbon on the View menu. Remove a single file directly from Windows Explorer: Wiping a File . Remove the contents of the Recycle Bin : Wiping the Recycle Bin . Remove several files in a single task: Wipe Lists . Wipe unused space on one disk: Wiping Free Disk Space . Wipe several disks at once Wiping Free Disk Space . Clean your computer, remove several files and folders, and wipe unused disk space simultaneously: Setting a Large Wipe and Clean Task .